Don’t mistake the simplicity of this recipe for ordinary. It’s an easy way to create an elegant dessert on the fly. Marinate 1 cup of frozen mixed berries with 2 1/2 tbsp. Amaretto. Let come to room temperature. Mash with a fork until lightly blended together, reserving 3 tbsp. crushed berries for topping. Soften 14-oz. container of vanilla bean ice cream at room temp just enough to be stirred. Transfer to a large mixing bowl, add berries and 1/3 cup dark chocolate chips. Mix thoroughly with a mixing spoon (do not beat with mixer). Transfer ice cream back to the container and return to freezer for at least 4 hours. Scoop ice cream into fancy bowls, top with crushed berries and chocolate chips. 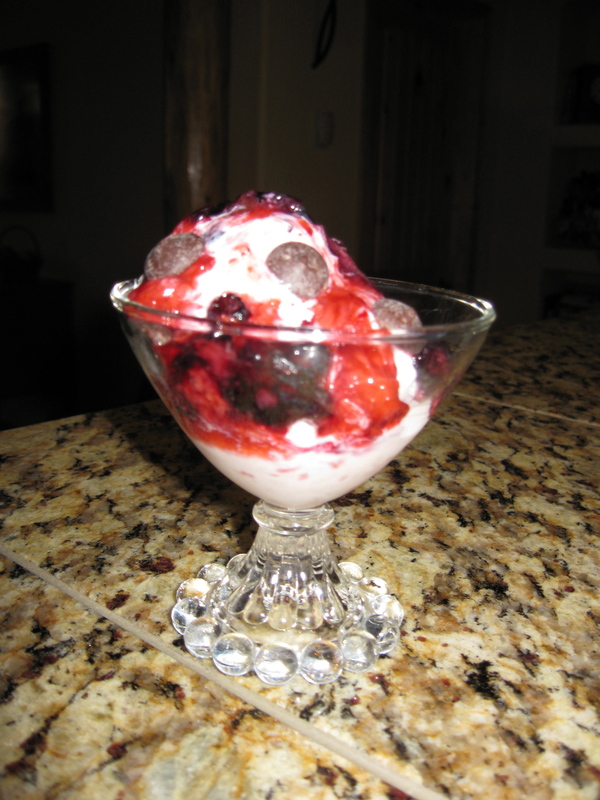 This entry was posted in Recipes and tagged ABQCityLife, Albuquerque, APPCityLife, chocolate, ice cream, recipes, Valentine's Day. Bookmark the permalink.